Baby Doe case: Authorities still don't know the identity of the young girl found dead in Boston weeks ago. 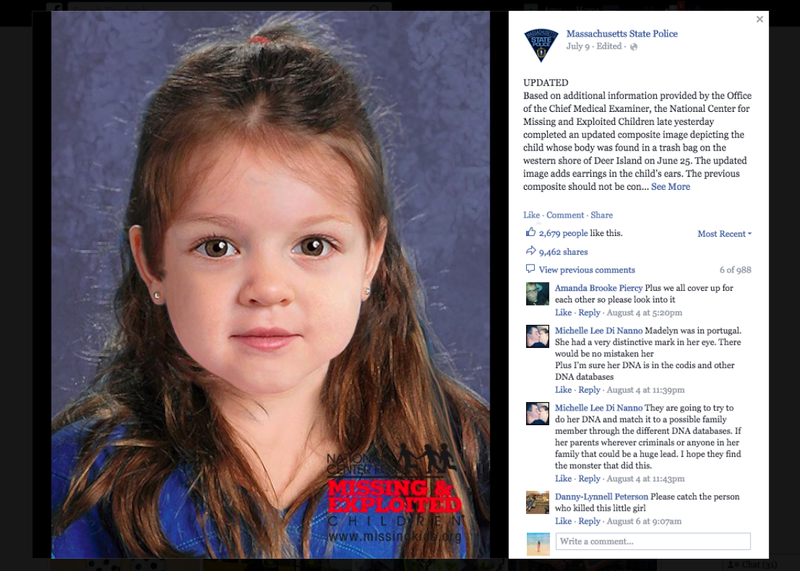 Massachusetts State Police posted a composite image of the child to Facebook last month. On June 25, a woman walking her dog on the Boston Harbor shoreline discovered something alarming: the body of a young girl, about four years old, left in a black trash bag. She was roughly 30 pounds, three feet tall, and hadn’t been dead long, according to a medical examiner’s report. Local authorities immediately sought the public’s help in identifying the child. In the weeks afterward, investigators worked to determine both her identity and the cause of her death—to no avail. No physical trauma or evidence of poisoning was discovered, and, despite the millions of views the case has received on a state police Facebook post, no identity either. Now, eight weeks after she was first discovered, Massachusetts investigators are still without leads on what has come to be known as the “Baby Doe” case. It is highly unusual, among missing persons cases, for so few clues to emerge over such a long time period, the New York Times reports. The Times also notes that the case highlights the particular difficulty of identifying children’s remains: Children of a young age usually don’t have extensive dental work, X-rays, or fingerprints that can be used to figure out who they are. DNA testing can only yield a match if sample DNA is specifically provided, or if a close relative of the child happens to be listed in a national database. New evidence from pollen samples suggests that the child was likely from the local Boston area. But beyond that, information has been scarce. Authorities are now banking on hair samples and extensive tissue tests to yield more information. The child has brown eyes, brown hair, and pierced ears, and the trash bag in which she was discovered also contained a zebra-print blanket.